Playgrounds.net Blog: Why Buy Wooden Swing Sets? 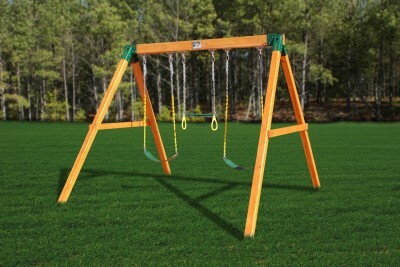 Swing sets are one of the most popular play sets in playground. Not only in commercial parks, these are a hit in backyard playground too. Though these are available in three frame materials; metal, aluminum and wood, parents in the United States of America prefer to buy wooden swing sets for their backyard. These are generally made of pressure-treated timber, redwood and cedar, which make them strong and enhance the durability. These are weather-resilient and naturally resistant to decay and rot, therefore, do not get degraded after a period of time. These sets do not get corroded during rain and becomes warm during sunlight like metal play sets. Kids' hand does not get slipped in wooden sets like in plastic equipment. There are proper bars and hinges installed in wooden swing sets for the safety of kids. Also, sturdy and heavy chains are used to connect swing with the sets. Moreover, these can easily withstand harsh weather conditions and lasts in the backyard for comparatively longer time. Outdoor wooden swing sets comes in two different styles; flat base and A frame base. While buying, you can select the one as per the surface level of your backyard. Before purchasing, make sure manufacture has designed it as per American Society for Testing and Materials (ASTM) and Consumer Product Safety Commission (CPSC) guidelines.